Comfortable and sporty are two adjectives that do not seem to be applicable to the same boat; in reality, the Off Course 41 S is capable of offering the thrill of speed as well as comfortable cruising. This new 41 footer was designed to meet the needs of those who love running fast and in short time over any stretch of water, yet enjoying the sporty and refined elegance of their boat. The aft deck clearly expresses this concept with a spacious settee in the roomy and comfortable sunbathing area. 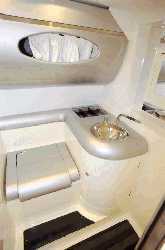 The overall layout features much comfort on deck and in the cockpit; the accomodation plan is intended for two persons, but it can easily serve four. Belowdecks, the large use of elegant materials and leather linings as well as the chromatic combination of brilliant colors offer an original and exclusive atmosphere, with a finishing level not to be underestimated. At sea, the Off Course 41 S best expresses herself when engine power is at its maximum, thus attaining the sporty velocity of approximately 47 knots. Displacement with test power: 8,830 lbs. Total engines and reduction gears: 2x2,793 lbs. Price with standard equipment and test power: Lit. 325,000,000 ex VAT. Cockpit: spacious, with lots of comfortable sunning capability; roomy GRP aft platform with scuppers for water drainage; swimming ladder. Galley: belowdecks with worktop, covered electric household appliances and pantry. The galley furniture is very well integrated in the surrounding ambience of the dinette. Optional: anti-fouling, cradle, hydraulic Mercruiser flaps fitted with position indicator, free and silenced engine exhaust, 3.5 kW current generator, electric windlass with chain, anti- scratch metacrylic windshield with steel frame, special external graphics, customized interior and deck furnishing. Helm station: comfortable, with easy-to-reach controls. Easy wheel steering from pilot's seat. Docking maneuverability: good. Responsive to minimal engine power. Deck: The design provided for spacious deck areas and cockpit. 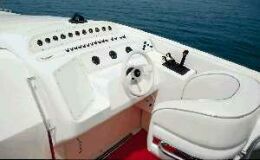 The arrangement is typical of sport cruisers intended for fast navigation, with comfortable settee in the cockpit as well as comfortable pilot's and co-pilot's seats. Electrical plant station: in compliance with safety rules and with very good quality electric cables, easy-to-see and easy-to-understand switches. the missing windshield. Even though the boat's aspect is more aggressive, the pilot's and the passengers' comfort is penalized during long passages. Another negative aspect is the missing anti- slipping material on deck.